growing up in a household, complete with an italian grandmother, definitely came with some fantastic culinary advantages. my interest in “all things food” started at a very early age and was fed and cultivated by helping my nana in the kitchen. i learned about rolling out pizza and pasta dough, making the best red sauce and, maybe the most important lesson… the snacking advantages that arise from helping out the cook. there were also some things learned that i have since let go in my adult years. catholic guilt and the idea that any stuffed pasta is an all day affair are high on that list. i think many of us grew up with certain meals that were thought to be difficult, time consuming and reserved for sunday dinner. stuffed shells was one of those exalted treats that i’ve come to realize only takes about 20 minutes to put together and tastes just as sweet on a tuesday! you can certainly use your own marinara sauce for this recipe, but i’ve included a quick cooking version that is perfect for making this a speedy preparation. mangia! 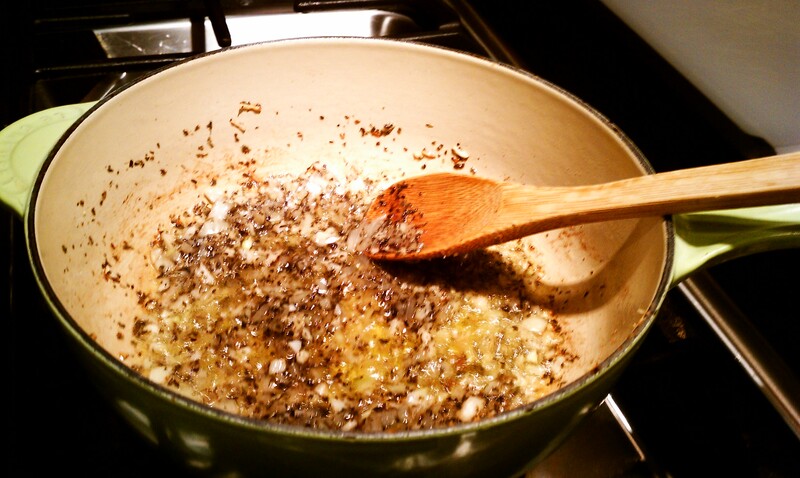 in a saute pan, cook the onion along with the salt and pepper in the olive oil until just soft, about 5 minutes. add the garlic and basil and cook for another 2 minutes. add the red wine vinegar and saute until all the liquid has disappeared. 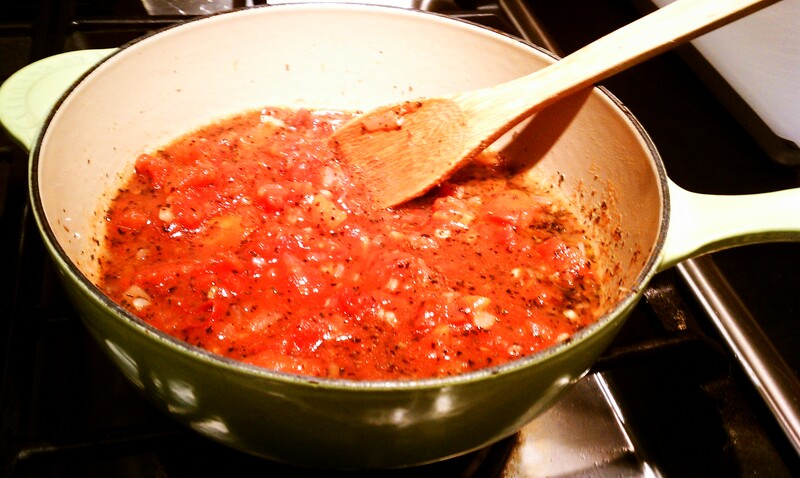 add the tomatoes and simmer on low while you prepare the shells and stuffing. 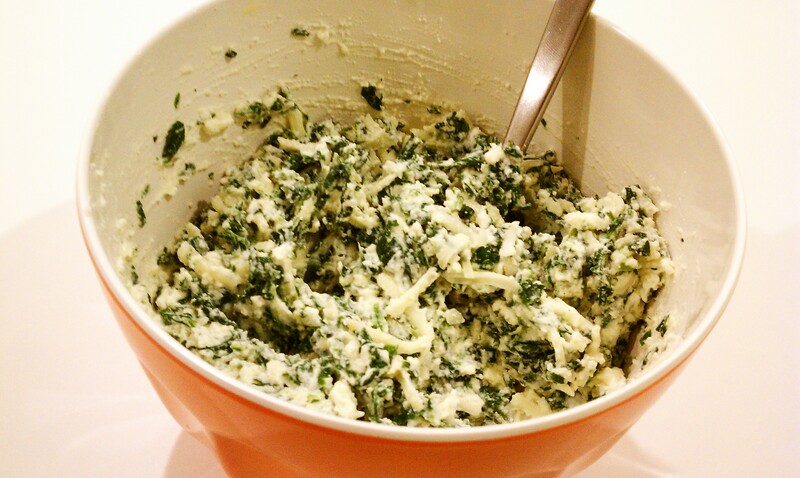 while your pasta water is coming up to a boil, stir together ricotta, spinach, egg, parmesan, mozzerella and salt and pepper and set aside. 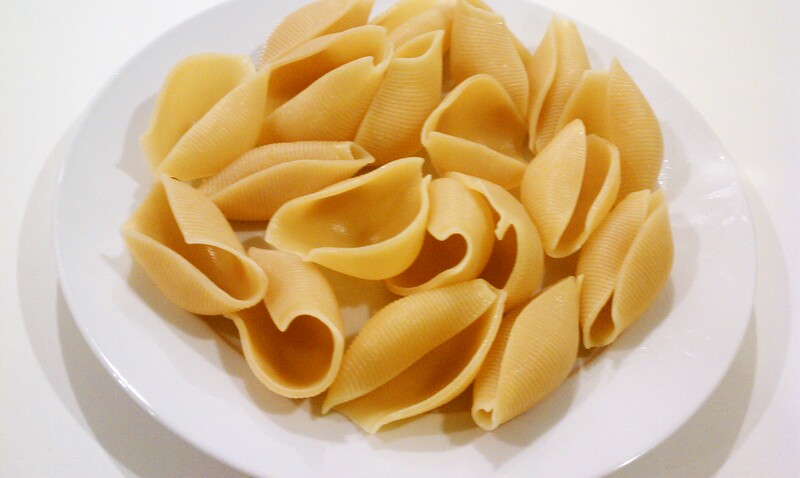 when your shells are cooked to al dente (this takes about 7 minutes). drain them and spread them out on a plate to cool (this will prevent them from sticking together). ladle about 1 cup of the sauce in the bottom of a 9×9 inch casserole dish. 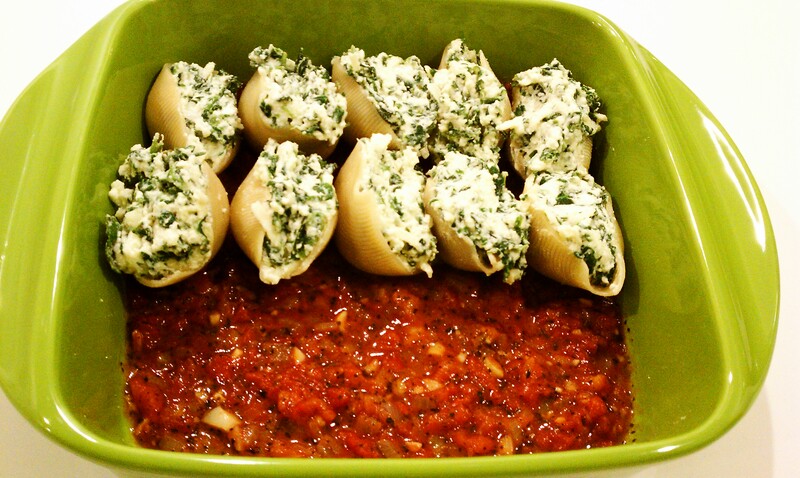 stuff your cooled shells with the ricotta mixture and place them in one layer on top of the sauce. 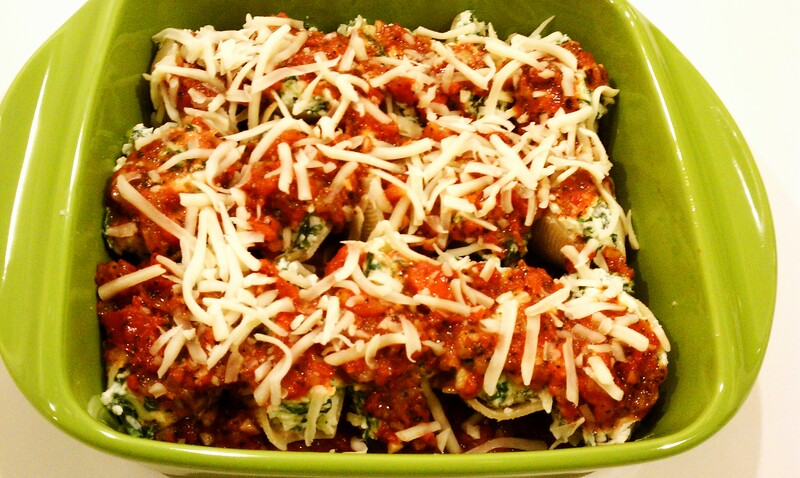 pour the remaining sauce over the top of the shells and sprinkle with the extra mozzarella. cover dish with foil and bake for 25 minutes. remove the foil and bake for another 10 minutes. let the shells rest for 5 minutes before serving. you can put this meal together in no time and have a “sunday dinner” feeling any day of the week. the shells get even tastier the longer they sit so feel free to prepare this the night before and bake it off when you get home from work. i really is that simple! 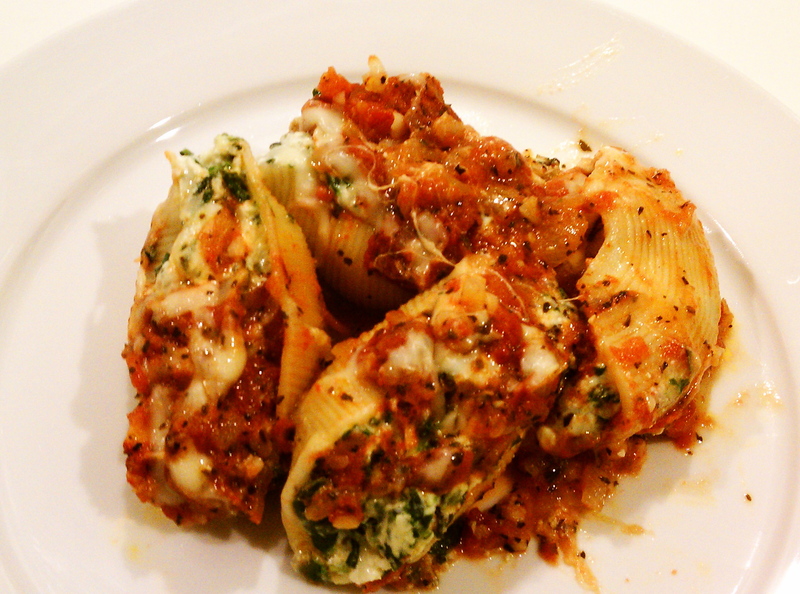 This entry was posted in cheese, Pasta, Recipes and tagged cheese, food, italian, pasta, recipe, stuffed shells. Bookmark the permalink. 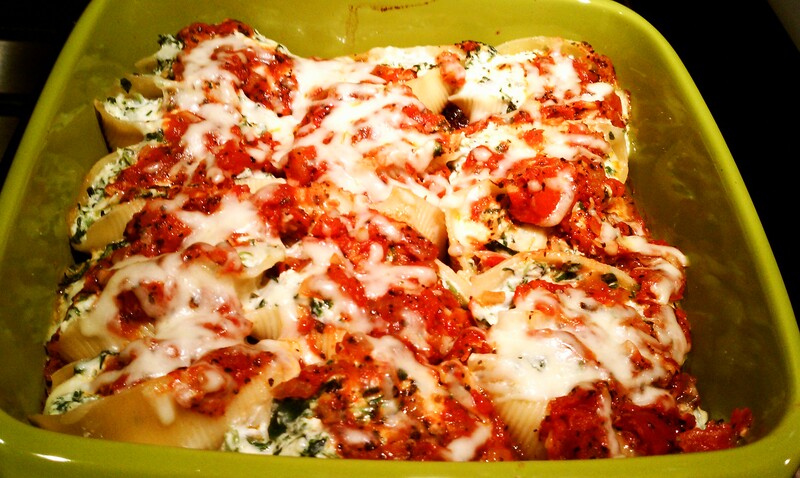 I make stuffed shells all the time and I simply love it. Most people don’t know how simple it is to make it. I loved your recipe.